Even though Blancpain’s Fifty Fathoms has been in production since the early 1950s, scholarship regarding this fascinating model continues to be written. The story of its origins are well known, rooted in solving the needs of an elite branch of the French Navy – the Service de Documentation Extérieure et de Contre-Espionnage – tasked with underwater espionage and other covert operations. The head of this unit was Captain Bob Maloubier, and he personally sketched out the watch that would one day be fully realized as the Blancpain Fifty Fathoms. Maloubier found a champion for his project in Blancpain’s CEO Jean-Jacques Fletcher - a passionate diver himself. Fletcher named the watch after the greatest depth that a combat diver was believed able to withstand at the time. The watch combined cutting edge features such as an anti-magnetic and water-resistant case, a screw down caseback, a "double O-ring crown system", an automatic movement and a rotating bezel. Extremely robust and reliable, it was truly designed by military professionals, and was soon selected by other militaries around the world for their diving units, including the U.S. Navy. 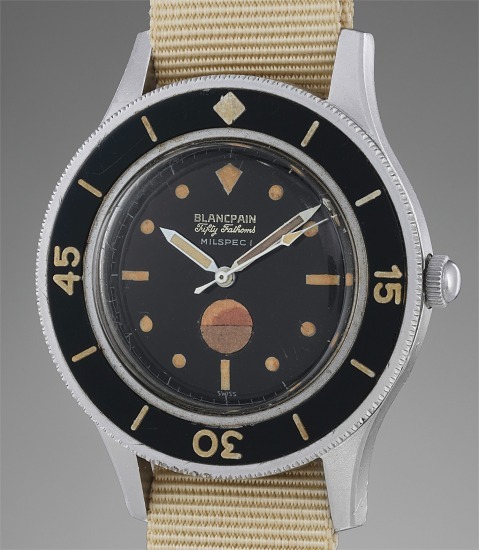 While the US Navy struggled to find a high grade diving wristwatch that complied to the "Buy America" act, an American watch importer named Allan V. Tornek saw a great opportunity to partner with Blancpain in order to present the Fifty Fathoms. Already approved by many armies around the world, the watch was soon confirmed by the US Navy. It became known as the “Milspec 1”, which stands for Military Specification.The present watch is a beautiful example of an early Fifty Fathoms ‘Milspec’ with a humidity indicator at 6 o’clock. It displays other military specifications such as a three-part body case and a diamond shaped marker at 12 o'clock on the revolving bezel. The present watch is not only a textbook example of an early Fifty Fathoms Milspec, preserved in unmatched condition, but also accompanied by the diving log of a U.S. Navy Mineman First Class (MN1), Earl Chester Merrill, during his training dives in the early 1960s until he was discharged from active diving service in 1964. Additionally accompanied by images of the serviceman during his time in the military, this Fifty Fathoms is well-known in the Blancpain collecting community, purchased from the son of the original owner about a decade ago. A Mineman in the U.S. Navy was charged with the delicate task of detecting and neutralizing underwater bombs. During the years Mineman First Class Merrill was active, the United States was embroiled in the Cold War, and flexing its military might on land, at sea, and in space, making MN1 Merrill an important element in the military-industrial complex and his Blancpain Fifty Fathoms Milspec the ultimate tool. As the watchmaking brand with the earliest founding date, Blancpain remains close to tradition, concentrating on classical mechanical watches. Established in 1735 by Jehan-Jacques Blancpain, the Le Brassus manufacturer today continues to innovate with the development of high-quality calibres and is proud of their heritage, having never made quartz watches. One of the firm's greatest successes was the Fifty Fathom wristwatch introduced in 1953 — the vintage models of which are now highly coveted by collectors. The earliest dive watch available to the market, Fifty Fathom came out a year prior to Rolex's Submariner. Another key model is the Air Command from the 1960s, considered one of the most mythical collector's watches due to their extreme rarity. Today, the firm specializes in creative innovated complicated timepieces.